You're Invited to Ghost Hill Cellars' Summer Picnic! Please join us on August 20th anytime from 12pm - 4pm for our First Annual Ghost Hill Cellars' Summer Party. Club Members, your cost is only $10 and includes a tasting of all the wines we’re pouring this summer plus one glass of wine of your choosing. Our Summer Picnic Menu will be gourmet sausages grilled by Mike, seasonal salads, and, of course, a special dessert. No guests to bring? We’ll even waive your fee when you upgrade your club membership to either Miner’s Claim or Prospector’s Gold club levels! Ask us for details. Love Ghost Hill but not a member yet? This is the perfect opportunity to check us out! Our vineyard is on a 240 acre 110 year old farm. Mike was born here 70 years ago, and Drenda has been with him here for almost 50 years. 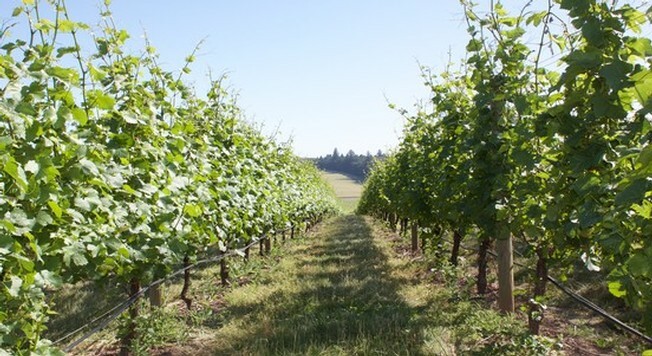 Pinot Noir is now our primary crop and we’d like to share our wines with you. We will extend the same offer to you as we have to club member guests – become a member and no charge for the event. See above link for club details. Please RSVP! We know you’re coming thirsty and hungry and want to make sure we have enough for everyone! Please email mikeanddrenda@ghosthillcellars.com by Monday, August 15th. All new in July! Join us in the tasting room for our new line up, we are now pouring our 2013 Bayliss Bower Pinot Noir, our 2014 Pinot Noir Blanc and our 2015 Spirit of Pinot Noir Rosé. We are proud to share that our 2015 Rosé has been chosen as a Cellar Select by Oregon Wine Press and our 2014 Pinot Noir Blanc has been given a 90 rating by The Planet Grape. Visit us for great tasting room only specials on our Pinot Noirs. Our regular tasting room hours are Friday, Saturday and Sunday 12 pm - 5 pm. Click here for directions. If you are not able to make it out to visit, click here to order these wines from our online store or give us a call at 503-852-7347 to get yours. Please join us on August 20th from 1pm - 3pm for our First Annual Ghost Hill Cellars Summer Party. This is a Club Members only event, but club members are welcome to guests. The cost will be $10 for club members which includes a tasting and one glass pour of your choosing and $15 for guests which includes a tasting. Menu will include gourmet sausages grilled by Mike, salads and dessert. Please RSVP to mikeanddrenda@ghosthillcellars.com by Monday, August 15th.